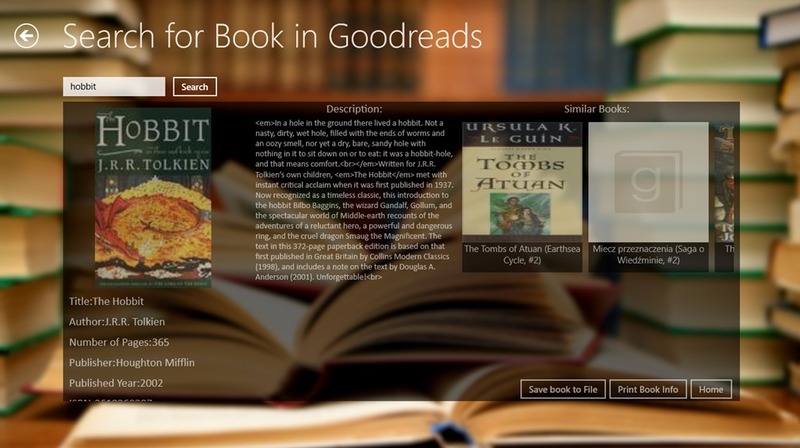 Goodbooks is a Windows 8 Book App. Goodbooks allows you to search for authors and books. You can make notes about any book or author and can save it. It even allows you to print information about the books and authors that you like. 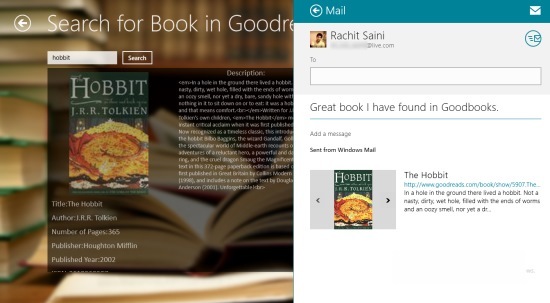 Not only this, Goodbooks even allows you to share with others over the internet using the Windows 8 Share Charm. 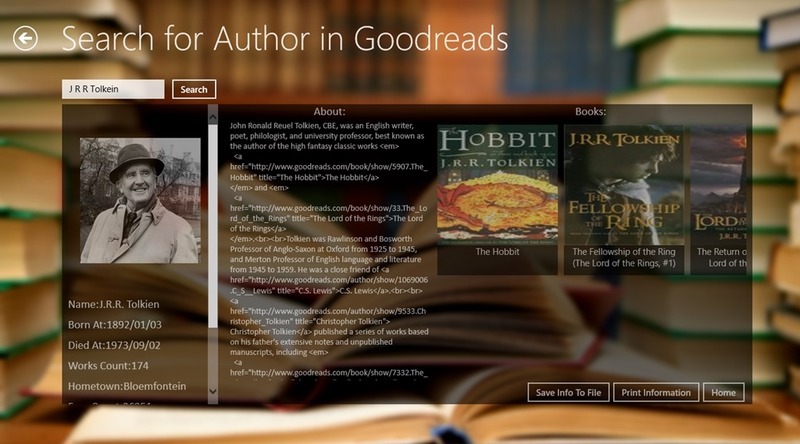 Goodbooks is freely available in the Books & Reference category of the Windows Store. Let’s get you some idea about the functionality provided by this Windows 8 Book App. As you land into this Windows 8 App, you will be shown all the options that are available for you. You can browse for any book or author using the functionality available in it. 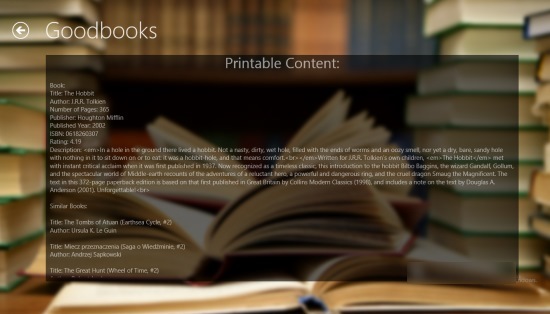 In this Windows 8 Book you can search for any author by using the Search for Author option. A good detailed information about the Authors is available when we search for any particular author using this option of this Windows 8 Book. When you search for any author, the result would be shown with three panels. 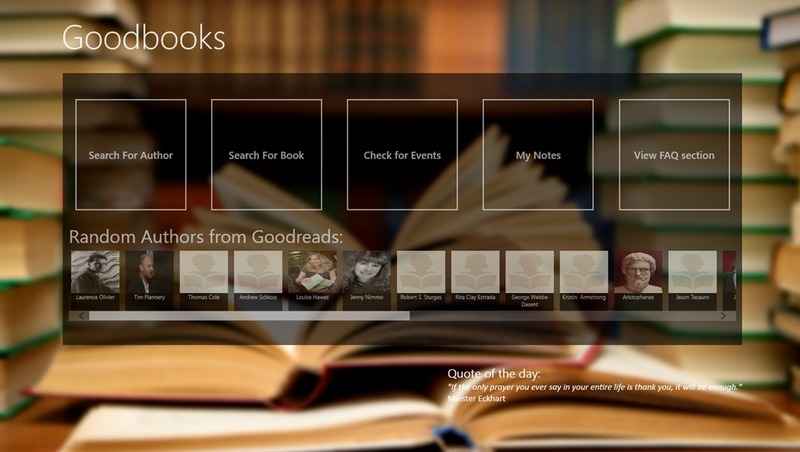 In this option of this Windows 8 Book App, you can search for the book by their names. Here also, for any of the searched book, same functionalities are available. Whenever you search for a book or author, then for the result three panels will appear. In the leftmost panel for the result, the details about the book or the author will be shown. The second panel will give information about the author and the books he has written. The third panel, if present (in case of authors), will show the books that the author has written or any other related books. The information that will be present in the second panel here will have HTML tags present in between the description. This panel is useful for the Save Info to File option of the third panel. Using that option from the third panel, you can save the information that is available in the second panel. The tags used in the description, explains the orientation of the data in the saved file. In addition to this, this Windows 8 Book app also gives you the ability to check events for books and authors from your location. For that, use the Find events option given on the main screen of this Windows 8 Book App. Events like release of books, or some kind of gathering related to a book or author, or some other related event may be seen from here. For that, the app uses the coordinates of your location (latitude and longitude). In addition to this all, this Windows 8 Book App also gives you the ability to share what you like over the internet. For that, you can use the Windows 8 Share Charm. In addition to this all, there is also a feature to save information for a book. When you use this feature of this Windows 8 Book App, it will save such info as a plain text file that will be saved where you have specified. Use the print book info option of any book to print information about any book. The Interface and working of this Windows 8 Book app are quite nice. Find out about the Books and authors with this app. Share with others using the Windows 8 Share Charm. Print and save info about books and authors. I used the app myself and was quite impressed. I was able to find about all the books and authors I searched for using the app. I, however, would like to reflect that when we search for a book or author, then in the result, the middle panel, although it provide good description, but the HTML tags were visible, wherever they were defined. They were also visible in the saved copy. Rest all is good. Check yourself to know better. Don’t forget to share your experience with us.